Ever feel like getting organized would be so nice, you just don’t know what to do first and you don’t want to spend a lot of money doing it? Yea I know how you feel! That’s why I’ve rounded up some of the best ways to organize and to do it for Free! Hurray! 1. Do your cupcake liners fly around your cupboards? Store them in a mason jar! 2. Save those cereal boxes and get your container lids contained! Here. 3. Another great use for those cereal boxes is to make some drawer dividers. Aren’t they adorable? 4. Wrap your ribbon around some craft sticks and you’ve got a beautiful way to store them! 5. Untangle those messy cords with some old toilet paper rolls. 6. Make yourself a Plastic Bag Bin to hold all your bags. I need this tip badly! 7. Use some turntables in your fridge to make it easier to find your food! 8. Put those mason jars to good use with a Mason Jar Storage Shelf. Just use leftover wood and jars and you won’t have to spend a penny! 9. Oh what a great way to organize those cans! 10. 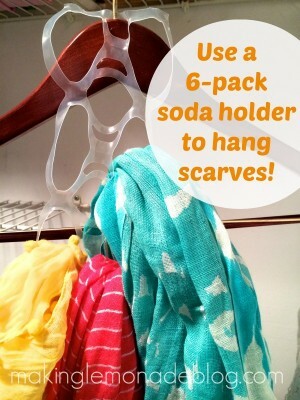 Speaking of soda, use your empty 6 pack soda holder to hang your scarves. 11 – 13. 3 Ways to Repurpose Baby Wipes Containers to keep your stuff organized! 15. Have you ever used your old cereal boxes to turn them into a magazine holder? Check it out here. 16. Use the packaging from shelves and organize a Spice Drawer! 17. Need to pack your chunky jewelry? Use a paper towel holder and washcloth! Check for details here! 18. This is a great way to organize all those discount cards! Check it out here! 19. 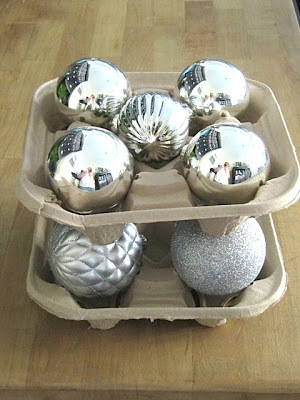 Save your drink holders to keep your ornaments protected! Great idea! I always hate throwing these away when they seem brand new still. 20. This is a great way to organize your home too! Create a Home Management Notebook. Fill it with all the important information that you want at your fingertips! Love this idea…this might just be my goal for next year! Tons of great ideas here! Happy Organizing! « This neighborhood knows how to do Christmas! The thing I like most about this list is that most of the supplies are things you would have around the house. Many organization ideas would make you go broke with all the little containers and baskets you need to buy. Cupcake papers in a Mason jar– genius!!! They drive me crazy, it’s hard to keep them organized in my pantry. Thanks for all the great organizing ideas– there’s something about taking down all the Christmas decorations that makes me want to refresh & improve the house! Thanks for the comment and the heads up on the cardboard! Always good to learn new things! Great solution for all problems.i love to know more. I liked the ribbon & craft stick idea, but FYI the link does not work! First I got an error, then It brought me to some page telling me to update something. Thought you should know. Thanks so much! I’m going to look into it. I love all these recycle ideas. I have signed up to receive your emails and am looking forward to all your great tips. I plan on using a couple of them this week.